Been a long time since i've tried to race in KRP but me and Stout thought we would give it a go tonight. Everything was going okay, Really enjoyable. We had a wet track, about 5 people on the server. A nice drying line (Somthing i have not seen stabely for a long time in GPB) and not a single person disconneting or Lagging. I mean come one. We get this sort of thing In GPB but we know the issues, we can get round them but This is a V1 version of KRP and the race funtion doesn't work?! I Know there's a lot of issues that need sorting but things need to be Prioratised and to all the people crying about that the game needs more content, No it doesnt, not at the moment. We can Mod things into the game. Lets fix the Things that make the game playable before rolling it in glitter shall we... If the game runs as well in race as it does in Practice, it would be golden but until then we've got a real issue. One thing that makes it almost unplayable is, that when the driver in starting place 1 accelerates, the 2nd driver has to follow in a certain area behind, which sometimes is really hard, because when the first driver accelerates hard out of a corner, it is sometimes nearly impossiblle to stay within the required limits of max distance behind. Especially with the lower spec karts, if you are only accelerating maybe 0.5s later than the guy in front, you still lose more than 30m to the guy at higher speeds. So far no real bug, but it is highly advisable to loosen the restrictions a bit (or have the option to do so), otherwise it is almost impossible to get races going, especially with lower spec karts or in wet conditions, because you sometimes cannot really accelerate very hard out of a slow corner. Then the real bug happened: When we restarted the race a couple of times, the guy in first grid position (Matty) would get a jump start every time, although he did not move early. Also, as Matty pointed out, in the chat window the penalties were not displayed one time, but in a endless loop. Something def wrong there. I am not sure whether it was caused by the wet conditions or the multiple restarts to the race. My suggestion would be to engage in a test session with some users (+ you and Snappe) and then try to debug and also to improve on the restrictions before the rolling start. At the moment it is broken and does not really work. As Matty mentioned it, here is a pic of the drying line which looked rather rough/pixelled. Just for your notice. We couldnt even get off of the start grid. I got DSQ for jump starting and i didnt even have a hand on the wheel. The few times we did start rolling the game said that x person was driving to slow and DSQ them even though we were in a tigh pack. Thanks for your comments. What happens in real life, if the first on the grid does not lead in a way that the guys behind can follow? I am sure race commission can penalize him too. In KRP that does not happen at all, only guys behind get penalized. So that should definitely be worked on in some way. And as Matty pointed out, there were definitely some bugs involved when trying to re-start the race. I dont know what happens irl, I remember many years ago, when I was online, that there was the same problem, it was almost impossible to race because there were people unknowing the rules, but when all people knew what to do, the starting procedure was easy. 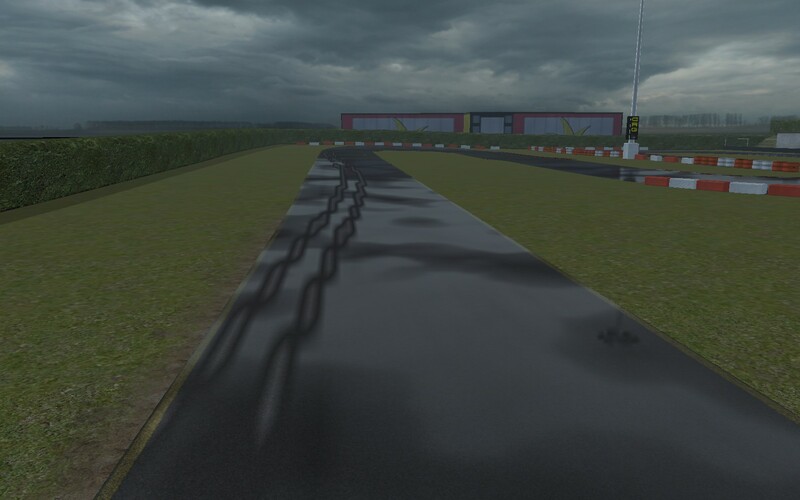 http://forum.kartracing-pro.com/index.php?topic=594.0 . The discussion definitely is two-fold. On one hand we had some obvious bug. After 2 or 3 re-starts, there was definitely something buggy. Also the chat messages not stopping is proof of some sort of bug. On the other hand, there is also lack of knowledge playing a role for most users. You are definitely right, practicing the start procedures also helps for the newbies to learn how it is done. We had similar situations with GPB with sighting laps and people not really then starting in their designated spots. So it would be even more crucial for Piboso to really highlight the existence of this forum and maybe cover the most crucial topics in a sort of FAQ with direct links (maybe even directly from within the game?). In a perfect world, every new player would browse the forum for most important topics and learn and study. But in reality, most just test the sim and try to learn on the fly. And when things are not quite self-explanatory or the instructions are hard to find, there might be some people just giving up. One approach would be to say "well then, f**k them" the other one would be to try to make crucial things more user friendly. Edit: another idea would be to give a server option of displaying a message explaining the rules for the start which the player can read without any time constraints. Only after all drivers have read the message, they have the option to go to the starting grid. That would ensure they have a breakdown of all the rules for the starting procedure. For servers directed at expierenced drivers, this option can be turned off. Yesterday I tried the rolling start but it was not possible to make a start after 5 attempts. In the first rolling start I saw the kart in front of me jumped and then bamp, some guys had DQ. Then we were only 2 in the track but no way to make a start, I was all time getting too slow and the message cycling...then I was in first position ans the pc told me I was the leader but the other friend overtook me, maybe also him took the message he was the leader, anyway I took DQ and the same message cycling 'too slow' even if my speed was right. Years ago all was working very well, hope Piboso fix this.